Larry's birthday was the 10th, and he had the whole next week off (during which he had such scintillating activities planned as watching someone install storm doors in our basement), and Susie and I said, "Oh, heck, no, it's still 80-something degrees and humid here and we can't figure out what to get Dad for his birthday, so let's give him a vacation!" 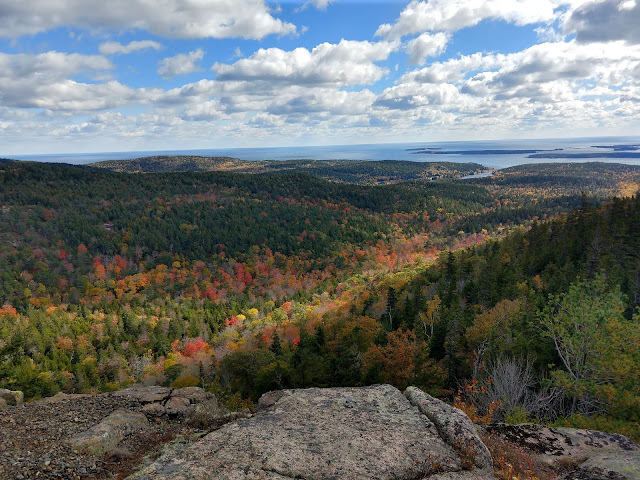 We Googled "houses for rent in Bar Harbor," which turned out to be quite cheap the third week in October, and we called Auntie Kate to see if she were up for meeting us (since she lives up that way), and next thing you know, Susie and Larry and I are in the car and heading north. I mentioned this plan already, but it was so long ago, I'm giving you a refresher. And let's just give a big shout out to Theo, who returned from Israel just in time to be Rachel's chauffeur and chef so we could pull this whole thing off. Now, something always goes awry on our family vacations. I accept that. Nothing is ever as great as we hope it will be, right? WRONG. This week broke the mold. The vacation was perfect - I mean, aside from the fact that Susie was convinced that the house was haunted, but I don't blame her. 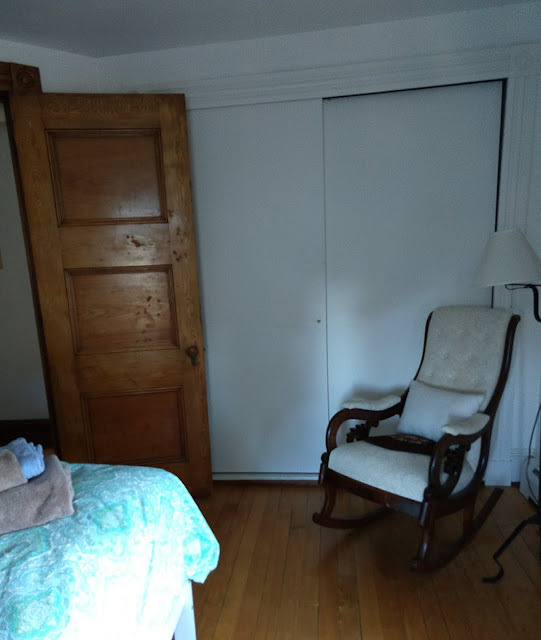 The rental was a hundred years old, with the requisite dark wood moldings and claw-footed bathtubs and ROCKING CHAIRS IN THE BEDROOMS, which Susie and I refused to look at at night, because we were both sure they would be moving. 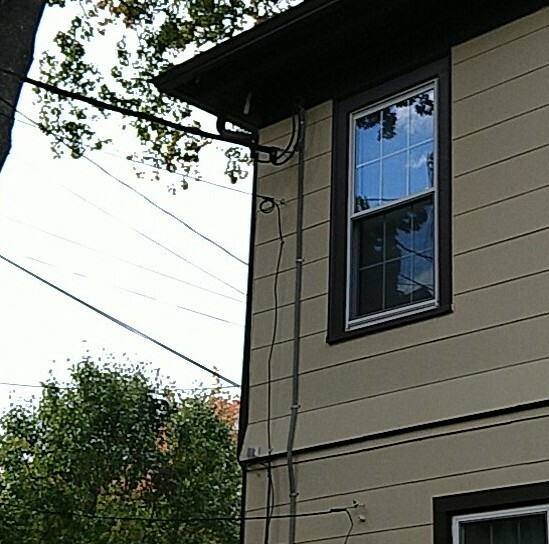 Also, there was the locked door in one of the bedrooms, which we assumed led to a storage closet for the owner's use, until we looked up at the side of the house one day and noticed there was a window we couldn't see from the inside. So we refused to look at that, too, because we knew a face would appear there, and then we'd have to use our phones to alert anyone inside that they should GET OUT, but when we'd open our texting app, there the face would be, staring back at us. Our imaginations sort of ran away from us, I guess. But, aside from the time spent worrying about spectral beings from another plane of existence, things were awesome. 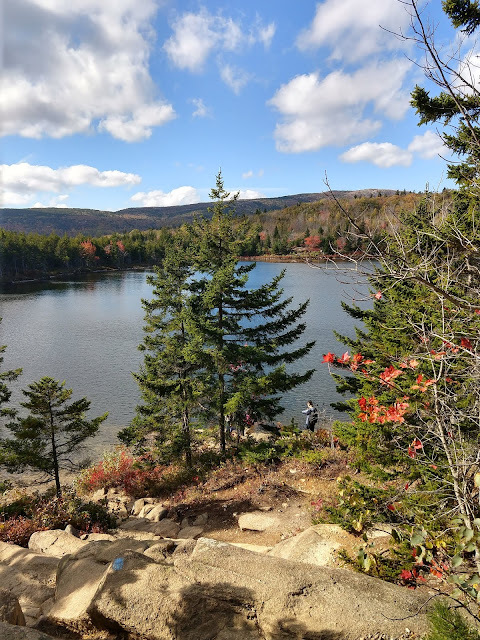 We went hiking every single day, and - as is Acadia's wont - we were treated to breathtaking views everywhere we turned. Just like what we had seen during our summer camping trips there, only now there were splashes of fall color making the scenery even more scenic. And it was less crowded, so we didn't have to worry about finding parking. And the air was magnificent - cold and brisk and downright rejuvenating after all the incredibly soul-sucking humidity we had suffered through since May. Oh, and did I mention? We weren't camping. No watching Larry get stressed out about pulling the trailer, no having to go hide while he attempted to back the camper into our spot, no hoarding quarters so we could have hot showers, no trips to the laundromat every 3 days. It was WEIRD. Is this how normal people vacation? I LIKE IT. Here, have some more scenery, why doncha? I feel sort of bad, because I don't have any funny stories to tell you, because nothing went wrong. I know, weird, right? These normal-people vacations could be very bad for my illustrious blogging career, I guess. I can live with that, though. Really, I can. But as a trade-off for our not getting funny stories, you get perfect memories. I am happy for you. Ditto to what Amara said. Stunning photos! Welcome home. Those are some amazing pictures! Enjoyed how you imagined the creepy parts of the house at their worst. Hike your own hike. If you hike better with a real bed and a shower, rent a house and hike. "Hike your own hike" - sounds like that should be on a T-shirt or something! So let me know sizes for you, Larry, Susie and Auntie Kate. Can I just climb right through my monitor and into that last picture? Because it is GORGEOUS! And you know, I'm trading off the dangling carrot of staying in hotels and rental houses so I can purchase a trailer that we have to back into camping spots and argue how to best manage it. I might be doing this whole vacation thing backward.